Note on reverse reads "Copy per Frank Farrow. 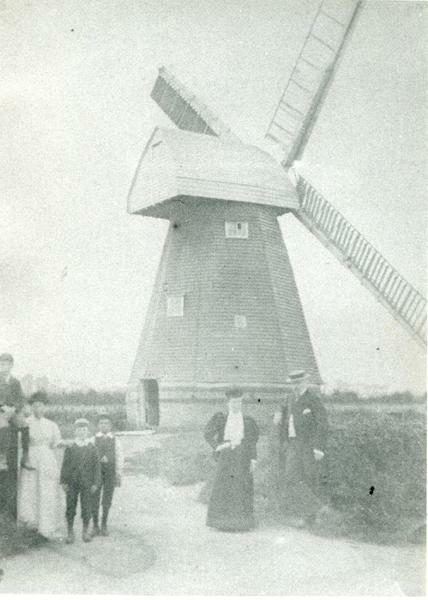 Herbert manning took mill on in 1881. Died 1901. Son Fred worked mill to 1903 when mill settled to one side & became unsafe. It then belonged to Ecclesiastical Commisioners. 3 [illeg.]. At gate Mr & Mrs Herbert Manning & three sons & daughter." Showing Herbert Manning, his wife Catherine, daughter Jane, son Frederick on the gate post, and younger brothers, Henry and John.